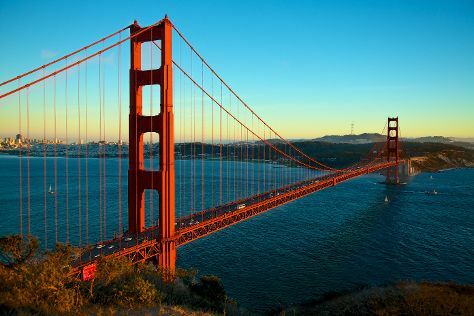 On the 22nd (Fri), snap pictures at Golden Gate Bridge, then step off the mainland to explore Alcatraz Island, and then take a leisurely stroll along Fisherman's Wharf. On the next day, shop like a local with Ferry Building Marketplace, then take a memorable ride with Cable Cars, then don't miss a visit to Lombard Street, and finally tour the pleasant surroundings at Golden Gate Park. For maps, traveler tips, other places to visit, and tourist information, read our San Francisco trip itinerary builder. Beverly Hills to San Francisco is an approximately 4.5-hour combination of bus, flight, and subway. You can also drive; or do a combination of taxi and bus. When traveling from Beverly Hills in December, plan for little chillier days in San Francisco, with highs around 58°F, while nights are about the same with lows around 45°F. Wrap up your sightseeing on the 24th (Sun) early enough to travel to Beverly Hills. Beverly Hills is a city in Los Angeles County, California, United States, surrounded by the cities of Los Angeles and West Hollywood. Go for a jaunt from Beverly Hills to Santa Clarita to see Six Flags Magic Mountain about 46 minutes away. And it doesn't end there: don't miss a visit to Santa Monica Pier, get in on the family fun at Warner Bros. Studio Tour Hollywood, admire the majestic nature at Santa Monica Beach, and get a taste of the local shopping with Third Street Promenade. To see traveler tips, maps, photos, and more tourist information, read our Beverly Hills sightseeing planner. Do a combination of subway, flight, and bus from San Francisco to Beverly Hills in 4.5 hours. Alternatively, you can drive; or do a combination of bus and taxi. When traveling from San Francisco in December, plan for a bit warmer days in Beverly Hills, with highs around 65°F, while nights are about the same with lows around 49°F. Wrap up your sightseeing on the 26th (Tue) early enough to travel back home.